In printing, bleed refers to printing that goes beyond the edge of the paper before the trimming process. This is the area that will be trimmed off to create the effect of color going to the edge of the paper. To illustrate, here is our business card template from our Standard Templates page, where you can download it for free. The bleed is an important element of the printing process. Printers cannot accurately print right to the edge of a sheet of paper, so we use a sheet which is larger than the document size. The printer prints beyond the edge of the document size (by 0.0625 inch or 1/16 of an inch), then cuts the paper down to the document size to ensure a clean cut. This bleed allows printers to safely preserve your design. 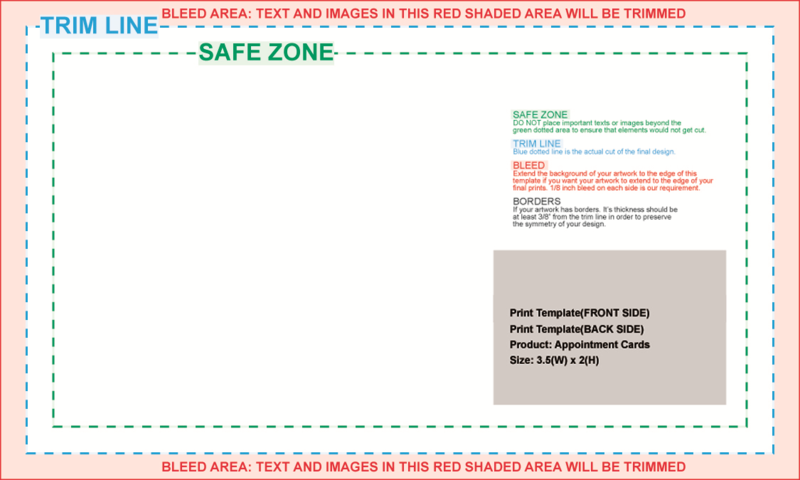 If no bleed is used for the printed document, an undesirable thin white line may appear along the edges of the paper. Most jobs we print require a 1/16” bleed over each edge. If your job requires die-cutting or is a booklet, a 1/8” bleed is required. Keep in mind that no text should go beyond the recommended safety zone or it may be cut off while the printed piece is being cut to size.